Cost to build a garage. Prices for garage construction. Cost to build a new 2 car garage will vary from $30 to $41 per square foot for standard construction including labor cost and materials prices. For a basic 2 car garage with no custom work involved as well as using regular (low cost) materials total expenditures will run from $13,200 to $18,040 to complete the work. 1 Prices in the chart are for a standard 2 car 440 square feet garage construction on a flat surface with no major excavation and site preparation work involved. Building a garage on a slope will result in higher construction expenses. Comprehensive list of all expenditures to build the garage will be summarized in itemize estimate issued by a contractor. Depending on work complexity and materials prices total cost will be adjusted accordingly. How the garage building costs were calculated? Construction expenses were calculated for building uninsulated 20’ x 22’ garage on a 4” thick concrete slab. All costs estimated for a standard two car garage with medium slope roof, 16’ x 7’ sectional steel garage door, 32” x 80” prehung side walk-in door, two 48” x 36” horizontal sliding vinyl windows, and exterior finished with 8” x 150” vinyl siding panels. What is cheaper to build attached or detached garage? It is not always a true assuming when the one wall is ready the total price of building a detached garage is much cheaper. Reduction in materials expenses to build a detached garage will not go down much more than 5 % - 7 % compare to building a free standing garage. In addition, a factor of proper connection of a new build garage to the existing house structure will keep the labor cost higher and normally total expenses will be at about the same level. How much does it cost to get a permit for building a new garage? The city or village will define the cost of the permit, but on average the price will vary from $190 to $270. 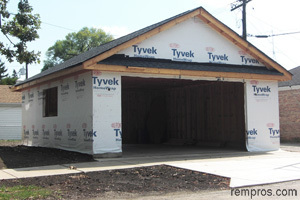 Permits for building a garage can be easily obtained by a homeowner. If a contractor will get the permit the cost will be included in the final estimate. What is the cost to build a custom garage? Custom construction of a new garage can’t be estimated per square foot or as an average. Everything will depend on the materials prices and labor expenses. Installation of cement siding and a slate roof might double the cost in comparison with vinyl siding and am asphalt shingles roof. If it is an attached garage and house design will require matching in style, costs of construction will increase as well. Summary of garage building costs per sq. ft.
2 Typically the bigger garage you build the cheaper it cost per square foot for identically designed structures and same materials used. How much did you spend for building a garage?